Matt Bell is the author of Cataclysm Baby, a novella, and How They Were Found, a collection of fiction, as well as three chapbooks, Wolf Parts, The Collectors, and How the Broken Lead the Blind. His fiction has appeared in Conjunctions, Hayden’s Ferry Review, Gulf Coast, Unsaid,and American Short Fiction, and has been selected for inclusion in anthologies such as Best American Mystery Stories 2010 and Best American Fantasy 2. 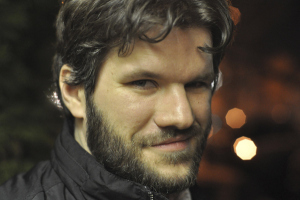 He works as an editor at Dzanc Books, where he also runs the literary magazine The Collagist. In Fall 2011, he began teaching writing at the University of Michigan. More here. 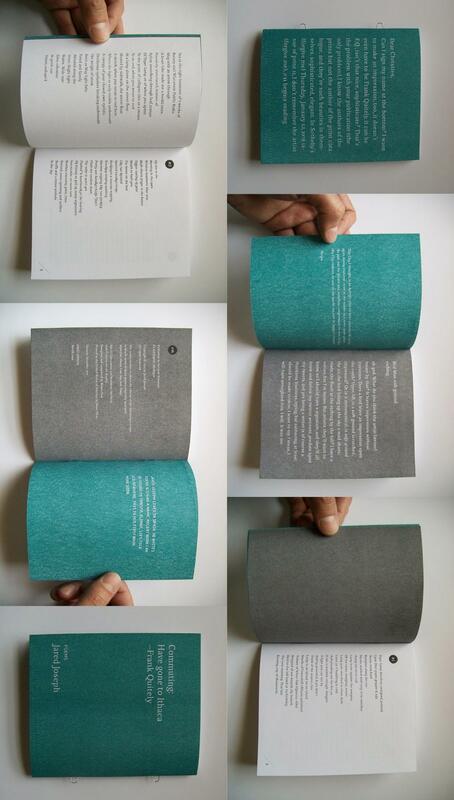 UFR: Your new book starts with an epigraph, a quote from Cormac McCarthy’s The Road. As a writer, you seem to be seriously interested, also, in reading widely. How important is it to actively read the work of others? Besides McCarthy, did you have any other influences and creative teachers for Cataclysm Baby? 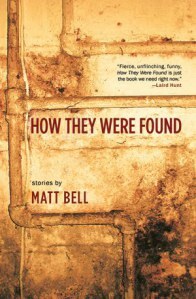 Matt Bell: For me, reading widely and constantly is probably the great bulk of what it takes to be a writer, and so I try always to be reading interesting books. I’m about halfway through Lance Olsen’s new craft textbook Architectures of Possibility, and there Lance quotes Samuel R. Delaney as saying that “It is almost impossible to write a novel any better than the best novel you’ve read in the three-to-six months before you began your own. Thus you must read excellent novels regularly.” That sounds slightly tongue-in-cheek to me, but the broad truth of it remains: All of the working writers I know who are doing the most interesting work are also the best readers. McCarthy is a broad influence here, although my main study of his work post-dated the bulk of the writing on Cataclysm Baby (although I had already read The Road, when it first came out). But you probably can’t write a post-apocalyptic parenting book without that being a part of it. There are a lot of influences here, so just to name a few: Beowulf and the Bible probably have as much to do with the voice of Cataclysm Baby as anything else. There are sections that turned into homages to Mike McCormack’s story “The Terms,” Shirley Jackson’s “The Lottery.” There’s a carved self-portrait called “Applewood Figure” in a museum in Baltimore that I probably couldn’t have written “Walker, Wallace, Warren” without having seen first. There’s a lot of fairy tale influence, I think. Really, with a book with this many moving parts, influence comes from all over, and has to be let in to keep it from becoming stale during the writing. UFR: Can you talk about the book a little bit? While you were writing it, what were you trying to explore? What do you see as the connecting thread between each small portion, or story? What would you say the book as a whole is about? Bell: When I was writing the first draft, I was mostly just trying to get from sentence to sentence: I didn’t know I was writing a book at first, didn’t know I was doing any more than following that first father’s voice forward into what I assumed would be a standalone story. Later I became aware of the possibility for a series of shorts, and then later still I started realizing there were some movements between the shorts that could be strengthened into a sort of proto-plot arc that would allow the book to function as a novella. I’m not sure I want to over-determine the connections for readers, or to explain too much about how the book works. I think that might get in the way of readers having their own experiences. So I’ll just say that there is a purposeful way it works, but that it’s perhaps subtle enough that you could never see it without missing anything. Hopefully it’s still working on the reader either way. 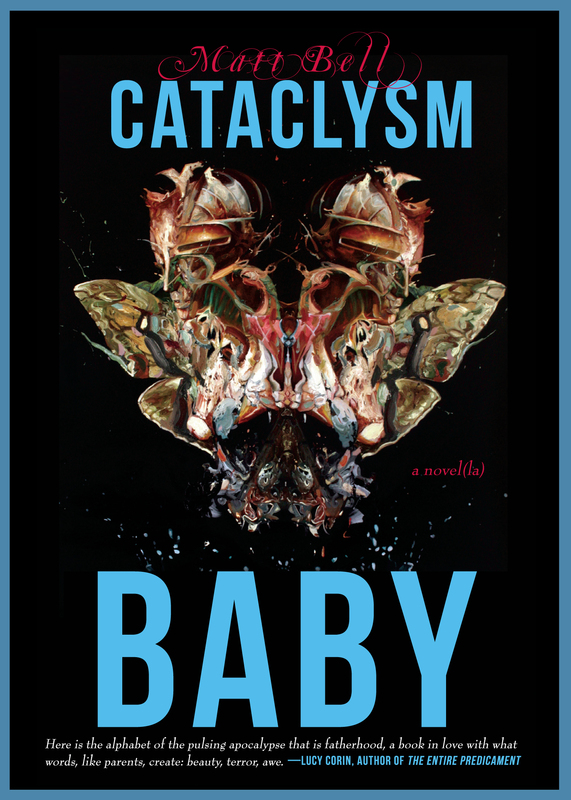 UFR: Cataclysm Baby provides a pretty refreshing twist on the genre of, well, cataclysm. Why do you think both post-apocalyptic and apocalyptic texts (and even movies) are so popular and intriguing? Bell: I think the apocalyptic has always intrigued people: You go far enough back, and every religion has both an origin story and a story about how it’s all going to end. And of course in uncertain times like ours, with global warming and endless wars and economic meltdown, the end of the world gains a little extra resonance. I also think that there’s a generational shift that’s happened as the environmental movement has taken off: We’re still within the first few generations that are aware of the exhaustion of the planet, that were raised to save the whales, to protect the rainforests, to see the earth as this thing that could be destroyed by us, and not by actual apocalypse. And so I think that adds gravity and urgency to a lot of the dystopian or apocalyptic stories. It’s certainly related to my own interest in them, anyway. 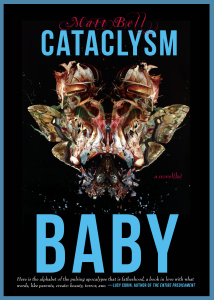 UFR: Adding your own voice to the mix of such work, what about Cataclysm Baby is its own? What do you think makes it distinct? Bell: I’m not sure there’s another book that approaches the material in the same way, but I really don’t think of it in those terms much. I was more interested in how I was moving forward from my own work—in what it made it distinct from the kind of work I was doing in How They Were Found, and short after—than in how it stacked up against others. UFR: Say three aspects of writing walked into a room: character, voice and setting. Which one would you greet first? When you write, which do you initially pay most attention to? Or do they all come together at once? Bell: It’s almost always voice first, for me: I don’t really have “ideas,” and so am generally starting with a piece of voice, just trying to follow that forward, to extend whatever power in it intrigued me in the first place. And in that voice is character, and that character presumably will eventually suggest setting as well. But the story starts at the sentence level of the voice, and the rest is (hopefully) revealed as I move forward. UFR: You seem to have a knack for writing stories in which the stakes are high, which is, as a reader, really great. In Cataclysm Baby, I’m thinking specifically of “Xarles, Xavier, Xenos,” which features a father who says to his son, “I have decided I would rather have no son than have you… I will give you a fifty-yard head start, and then I will shoot just once.” My question, then, is how do you build and layer your stories to a point where such tension is possible? Do you start a story with a conflict in mind or do you write into it? Bell: I’d say that I generally write toward the conflict, but there’s got to be some sense of conflict or want in the first sentence too: Especially in pieces this short, the reader needs to be aware of the stakes and propelled headlong into the crux of the thing. There’s no reason to hold back or delay. Every sentence should somehow build the conflict or leverage against it or undercut what we’ve been told so far. If I can do that, then I can keep the whole thing fraught throughout. UFR: Besides being the author of Cataclysm Baby, you’ve produced other collections such as How They Were Found, and also Wolf Parts, The Collectors and How the Broken Lead the Blind. And surely you were writing long before even those. When did you first start writing? Can you remember back to your first time trying to put a story together? Bell: I wrote when I was really young—mostly just ripoffs of the kind of high fantasy novels I was reading at the time—but then I didn’t through high school or the beginning of college. I started writing again when I was 18 or 19—just terrible angsty poetry—and then started writing fiction more seriously when I was 20 or so. I’m 31 now, so that’s about ten years of real work, and with maybe a little more than half of that being the kind of near-daily writing practice I have now. More importantly, I think: I’ve always, always been a hungry reader. What I can’t remember not reading all the time, not reading as much as I could. Even now I read all the time, and that provides me at least as much as my daily writing does. Probably more. UFR: Now, do you consider yourself a writer? What do you think it takes to call yourself, or be called, writer? Is it something you earn? Something you become? Something else? Bell: I think it’s mostly a role you choose to take on, and that you do this through both the hard work and also a sort of self-fulfilling prophecy. The humanities in general are a field in which we rarely wait for someone else to invite us into the conversation: We put ourselves out there as if we already belong, and then, if we’ve done the hard work and if we’re very lucky, people begin to act as if we do in fact belong. Thankfully, there are all these points of entry into the writing/literary life: Not just through our own work, but also—and perhaps better—through the enjoyment of and service to the work of others. Editing and reviewing and teaching and even just showing up at readings in your community all provide access to the broad conversation of contemporary literature, and I think make it easier to feel like writing is something worthy of claiming in your life. Bell: The best book I’ve finished lately was probably The Guardians by Sarah Manguso, which is astonishingly good, and again raised my expectations for everything she does. Right now I’m reading a handful of books, I think: I’m about halfway through both Sara Levine’s Treasure Island!!! and J.R. Angelella’s Zombie, both of which are fun and smart in different ways. I got Jack Gilbert’s Collected Poems in the mail yesterday, and of course there’s so much great stuff there. And then I’ve been picking my way through William Gass’s new book of essays, Life Sentences: In addition to his fiction, he’s also one of my favorite essayists, and one of the smartest writers on writing. UFR: Last, what one piece of advice do you have for other writers, or for aspiring writers? Bell: The biggest thing I might suggest is for other writers not to focus all their energies on themselves: engage your community instead. Write book reviews, post about stories in lit mags you love, interview writers who intrigue you, go to readings or volunteer for a small press. Find someway to make your literary life not always about yourself, and I think you’ll not only find a community there to participate in, but also your own work will open up in new ways, thanks to this energy you’ve expended on others. For me, at least, this continues to be an invaluable part of my writing education, and of my literary life. UFR Presents: Between What is Calling Me: A Conversation with Curtis SmithIn "UFR Presents"